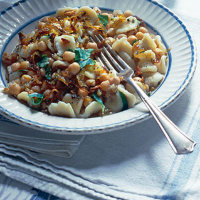 The 'lightning' is traditionally the broken bits from the end of a bag of pasta, though I like to use orecchiette (little ears) for this robust Tuscan dish as the chick peas sit elegantly in the hollows of the pasta. Bring a large saucepan of salted water to the boil. Add the orecchiette; keep the lid on till the water is boiling again. Cook until al dente. In a food processor, whiz the bread into breadcrumbs. Toss them in 3 tbsp olive oil with a pinch of salt; toast in a frying pan over a medium heat for 5 minutes, until gold. Set aside. Melt half the butter with the remaining olive oil over a low heat, add the onion, rosemary and a pinch of salt, stir, and cook for 3–4 minutes until the onions are golden. Drain on kitchen paper and keep warm. Drain the pasta and set aside. Put the chick peas and the stock in the pan and return to the heat, stirring in the remaining butter. Divide the pasta between four warmed serving bowls and ladle over the broth. Top with the caramelised onion, the breadcrumbs and the basil leaves. Serve at once.